Modern well equipped attached bungalow set in the heart of the picturesque Village of Lochgoilhead within the Argyll forest and Loch Lomond National Park. Stunning mountain and sea views make this a highly desired destination for a relaxing break. Modern attached bungalow on one level, 3 steps down from road & 4 steps up to entrance. The accommodation comprises of hallway leading to a fully tiled bathroom with shower cubicle & heated towel rail. The brightly decorated bedroom has a comfortable double bed, wardrobe, armchair, bedside cabinets, wall heater and is carpeted. The lounge contains a 2 seater leather sofa, a relaxing recliner armchair, glass dining table, glass side tables, 40 inch t.v. & wall heater. The kitchen is fully equipped with kettle, toaster, microwave, fridge with icebox, ceramic hob, full oven and ample crockery,cutlery pots and pans. Laminate flooring throughout hall, lounge and kitchen. The property is a 1 minute stroll to the sea front,local pub/hotel and post office/shop. there is a large sun filled garden with views to the surrounding hills,the garden is ideal for long relaxing bbq days. The apartment is the perfect unit for couples or a single traveler offering direct access to an abundance to outdoor activities. The property also benefits from secured wi-fi and satellite t.v. with Sky sports. There are a multitude of stunning hill walks from the relatively easy to the very demanding. Boat hire for both fishing and leisure trips on the Loch. Lochgoilhead is the perfect starting point to explore the north west of Scotland, places such as Dunoon, Inverary, Oban, Glencoe, Loch Lomond and The Trossachs all within a leisurely drive with many pubs, hotels and restaurants dotted along the route. Short breaks available throughout the year ( 1 night stays considered ) please check availability and prices. 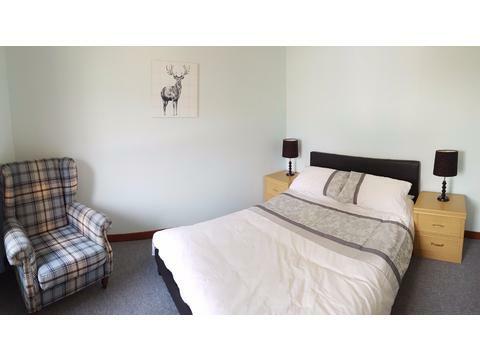 Excellent accommodation set in the heart of the picturesque Village of Lochgoilhead. The perfect place for outdoor activities,there are a multitude of hill walks,fishing,boating and golf. Superb starting point to explore north west Scotland.